Categories: Activities, News, Performances & Donations | Tags: activity, arts and crafts, boston, brookline, free, free kids' music, henry bear, june, Kids Music by Marcie, marcie, parenting, performance, show, singalong, songs, stories, storytime, summer, toddlers, toys | Permalink. The Charlestown YMCA on Saturday will hold a free event meant to inspire children to keep their minds and bodies active. The event will feature arts and crafts, sports clinics and discussions on diabetes prevention awareness as well as a fire truck visit, among other features. The event will run from 10 a.m. to 2 p.m. at the Charlestown YMCA, 150 Third Ave., in Charlestown. The event is part of the organization’s national initiative to improve families’ health and well-being and will also aim to teach families how to develop a healthy routine at home, according to the Charlestown Patriot-Bridge. Categories: News, Performances & Donations | Tags: activity, boston, charlestown, children, event, family, free, free kids' music, healthy kids, Kids Music by Marcie, music, performance, show, stories, toddlers, whole foods, ymca | Permalink. Belmont Savings Bank is pleased to be the primary sponsor for the 14th annual Belmont Egg Hunt! The egg hunt will take place in the Chenery Middle School field for children ages 9 and under. Toddlers will hunt in the playground. Bring your camera and take photos with the big bunny! Organized by the Belmont Activities Committee, a volunteer group of Belmont citizens, Egg Hunt festivities will begin at 9:45 am. 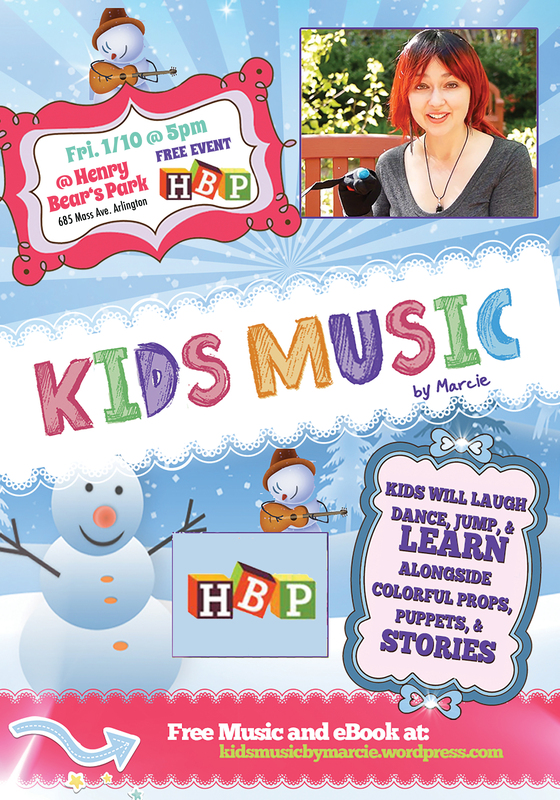 Entertainment will be provided by Marcie of Kids Music by Marcie. The event will be held rain or shine. Free refreshments will be served. Categories: News, Performances & Donations | Tags: activity, arlington, belmont, belmont savings, boston, bunny, chenery, children, cultural au pair, easter, egg hunt, event, family, free, free kids' music, fun, infants, mommybites, performance, prizes, scavenger hunt, show, singalong, toddlers | Permalink. 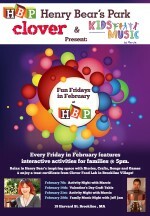 Come out to Henry Bear’s Park Family Music Night for a special winter performance! Kids will sing, dance, laugh, and learn. FREE!!! I’ve been a huge fan of Henry Bear’s Park since discovering it during my nanny years in Brookline. It’s a bright and friendly place full of toys, games, and books that inspire. Categories: News, Performances & Donations | Tags: arlington, boston, event, family, free, henry bear, kid's music, kids, marcie, music, performance, show, toddler, toy store, toys | Permalink.